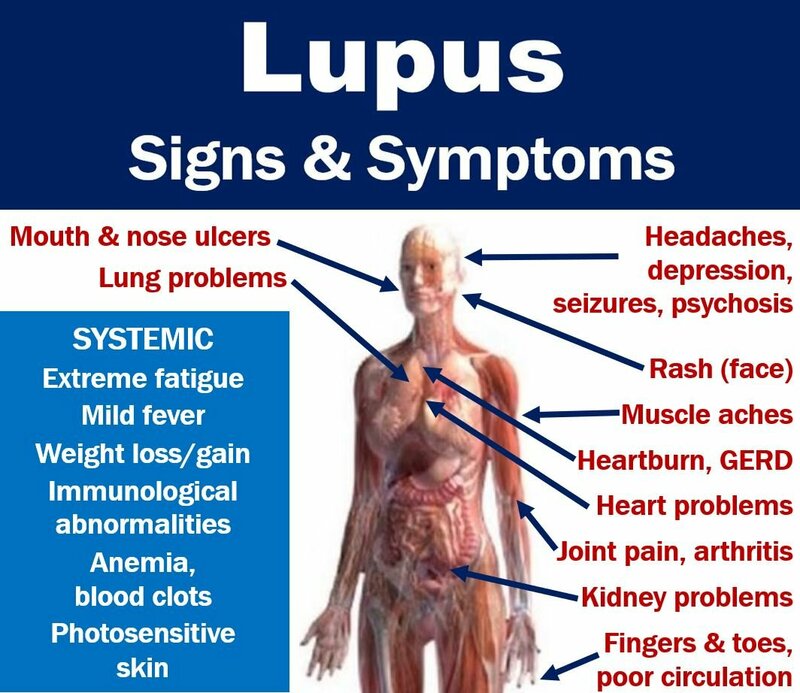 Lupus is a systemic disease; this means it attacks many parts of the body, i.e., several different organs. 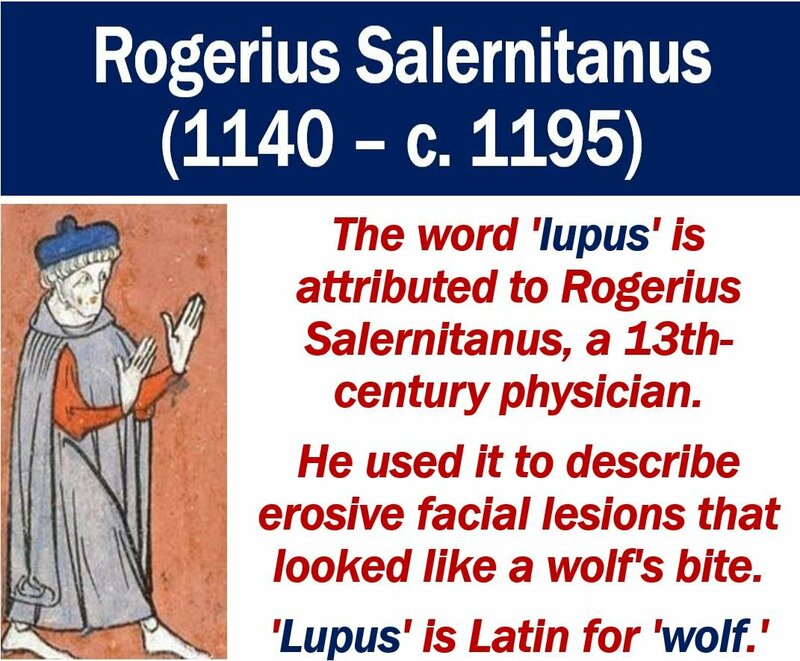 Therefore, there is a wide range of possible lupus signs and symptoms. A symptom is something the patient experiences or feels. A headache, for example, is a symptom. Nobody but the patient can detect or observe a headache. A sign is something that both the patient and other people can detect or observe. Rashes and swellings, for example, are signs. The doctor, nurse, family members, colleagues, and friends can detect a rash or swelling. Therefore, among the lupus signs and symptoms, extreme fatigue is a symptom while anemia is a sign. Skin rashes are very common among people with lupus. When rashes appear, they tend to do so on the face and arms. Some environmental factors can worsen skin rashes considerably. The vast majority of people with lupus, i.e., 90% experience fatigue and malaise. Fatigue means extreme tiredness or exhaustion. Malaise is a general feeling of being ill, weak, and having no energy. According to John Hopkins Medicine, some patients say that a short 1½ nap in the afternoon helps. For many people with lupus, however, extreme fatigue persists, even after resting. Lupus signs and systems vary considerably from patient-to-patient. Therefore, no two cases are ever the same. Lupus can affect many different parts of the body. Low-grade fever is common among lupus patients. In this context, ‘low-grade’ means ‘mild.’ A low-grade fever is slightly above a human’s normal body temperature, i.e., marginally above 98.6°F (37°C). The temperature of lupus patients with recurring mild fever does not exceed 101°F (38.3°C). It is often a symptom of an approaching flare-up. However, it is important to remember that a high temperature may be due to an infection or inflammation. It is therefore important for patients to be aware of their body patterns. If you notice anything unusual, you should tell your doctor. Lupus can cause patients to either gain or lose weight. When lupus activity increases, many patients lose weight. Also, some drugs can kill the appetite, which ultimately leads to weight loss. When examining a patient’s lupus signs and symptoms, the doctors may conclude that loss of appetite is linked to a medication. He or she may suggest a different treatment regime. While some drugs may trigger weight loss, others may have the opposite effect. Corticosteroids, for example, typically make patients put on weight. Patients on corticosteroid therapy need to make sure they follow a healthy diet. They should also try to exercise for at least thirty minutes four times a week. Depression is common among patient’s with lupus, says Lupus UK, a British charity. It is difficult to tell whether depression is an integral part of the disease or a consequence of it. In other words, do patients have depression because they have to live with lupus or is it part of the illness? Lupus is a chronic and often painful disease. ‘Chronic’ means persisting for a very long time or constantly recurring. Diabetes Type 1, for example, is there for the rest of the patient’s life. Therefore, it is a chronic disease. Some medications, such as prednisone, increase a patient’s risk of developing clinical depression. – Often feeling anxious or sad. Some patients feel anxious and also sad all the time. – No longer wanting to do things that the patient used to like, i.e., they are no longer fun. – Restlessness, frustration, and irritability. – Insomnia, i.e., finding it hard to get to sleep or staying asleep. – Sleeping too much or too little. – A change in eating habits. The patient may either overeat or undereat. – Stomach problems, headaches, and other aches and pains that do not respond to treatment. – Memory problems. The patient may also find it hard to concentrate and make decisions. – Fatigue, even after adequate sleep. – A feeling of helplessness, worthlessness, and also guilt. – Suicidal thoughts. Patients may also have thoughts of hurting themselves. People who have these signs and symptoms should talk to their doctor. Do not attempt to self-diagnose by going through the list. Only a medical professional can accurately diagnose depression. People with GERD can experience a burning sensation in the chest or throat. We refer to it as heartburn. Heartburn is due to acid reflux, i.e., stomach acids entering the esophagus. The esophagus is the tube that connects the stomach with the pharynx (throat). Some lupus patients may develop peptic ulcers, i.e., open sores on the stomach’s inside lining. Peptic ulcers may also develop in the upper portion of the small intestine. Steroids and NSAIDs increase the risk of developing peptic ulcers. The letters NSAIDs stand for non-steroidal anti-inflammatory drug. Ibuprofen, naproxen, and aspirin, for example, are NSAIDs. OTC antacids, such as Maalox or Tums, help reduce the symptoms of heartburn. OTC means over-the-counter, i.e., you can buy it without a doctor’s prescription. The doctor may also prescribe a histamine2 blocker or a proton-pump inhibitor. Eating small meals and reducing caffeine consumption can help to minimize the risk of developing gastrointestinal problems. Sitting upright after eating also helps. More than ninety-percent of lupus patients experience joint or muscle pain at some time. Lupus arthritis, unlike rheumatoid arthritis, does not typically cause severe destruction of the joints. It is also less disabling than rheumatic arthritis. Patients most commonly complain of pain in their hands and wrists. When the total number of red blood cells or amount of hemoglobin declines, a person is suffering from anemia. Approximately fifty percent of children with lupus develop anemia. The anemia may be due to a drug’s side effect or the disease itself. Many patients do not have signs and symptoms that suggest blood abnormalities. Therefore, it is important to have periodic blood tests. In other words, a patient may have a blood problem without suffering any symptoms. They need to undergo regular blood tests. Blood clots are common among people with lupus. Deep venous thrombosis or pulmonary embolus, for example, are clots in the legs and lungs respectively. About half of all lupus patients experience kidney problems. In some cases, the condition may be life-threatening. They may become apparent when the patient has a fever, loses weight, or has a rash. Kidney problems may also become apparent when the patient feels ill with arthritis. In most cases, symptoms only begin to emerge when the kidney disease is at an advanced stage. A urinalysis, i.e., urine test, can detect the earliest signs of kidney disease. As many signs and symptoms are possible, doctors tend to prescribe several different drugs. That is why the global lupus drugs market is so big. In this Johns Hopkins Rheumatology video, George Stojan, MD, talks about the signs and symptoms of lupus. Prof. Stojan is Assistant Professor of Medicine at the Johns Hopkins Lupus Center.